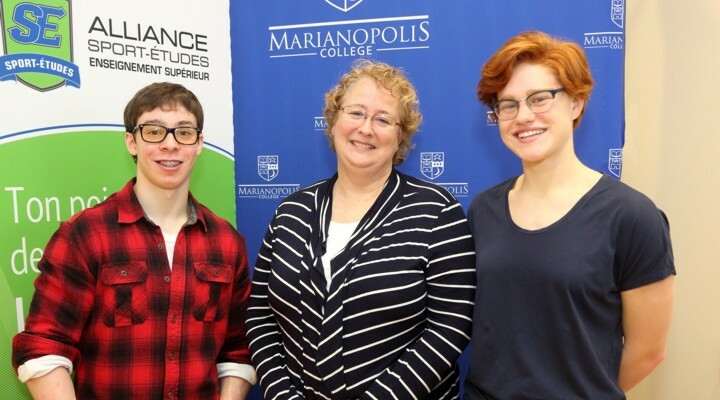 A winning partnership – To help its elite student-athletes balance academics and athletic training and competition, Marianopolis partners with Alliance Sport­-Études. In fall 2017, 1,250 student-athletes from the Quebec Major Junior Hockey League and over 50 sports federations were enrolled in member schools. Are you in a Sport-Études program in high school and you don’t want to choose between your competitive edge and an excellent pre-university education? Then consider Marianopolis: our partnership with Alliance Sport-Études and our century-long tradition of supporting our students means you get to succeed both in sports and academics. We designed our Sport-Études program for athletes like you, strong students who want to continue with their chosen sport. That’s why every year, elite athletes choose Marianopolis as their entry to the world’s top universities, many of them in their first-choice program. At Marianopolis, you don’t have to compromise your choice of college in order to continue with your athletic training. Your unique needs as a high-performing student-athlete are cared for: you achieve both your athletic and educational goals without losing your competitive edge or sacrificing your academic success. Opportunities to win scholarships through the Alliance’s foundation, which awarded more than $120,000 in the 2013-2014 academic year. For more information, contact Patti McDonald, Academic Advisor. Marianopolis is providing me with excellent support as a student-athlete. The Academic Advisors have helped to ensure that I don’t lose NCAA eligibility. I’m able to adapt a full Science course load to my training schedule. This way, I can make it to every class as well as every training session. I chose to come to Marianopolis not only for its amazing reputation but for its willingness to accommodate my sports schedule and manage my school schedule. I maximize my training while getting the education I need to progress in my academic career. The Academic Advisors are terrific, open-minded and willing to help you maximize your school and sports schedule as well as answering pretty much any question you may have about education. Thanks to the support I get, I am able to get success in the sports world as well as the academic world. Education has always been extremely important for me and I was always part of the top students in secondary school. I wanted to go to the best CEGEP and was very fortunate to be accepted at Marianopolis. They give me an exceptional schedule that fits perfectly with my 7-days-a-week soccer schedule. The teachers are truly exceptional and they understand how hard it is to be a student-athlete. I’ve had an exceptional experience here at Marianopolis and strongly recommend the school to anyone who wants to be an accomplished student-athlete.